Xenics, Europe's leading developer and manufacturer of advanced infrared detectors, cameras and customized imaging solutions from the SWIR to the LWIR realm, will return to participate in VISION. Perhaps the biggest machine vision trade fair in Europe for the year, Xenics will showcase a portfolio befitting this important bi-yearly event. The company’s best line-up of infrared cameras for the industrial market will be presented. A brand new InGaAs linear camera, the Manx series, will be announced during the three-day event. Visitors will also be able to catch first glimpses of the Wildcat 640, an upcoming area-scan InGaAs camera series set for release next year. Xenics exhibits in booth 1G51 at the Messe Stuttgart Exhibition & Trade Centre. Xenics is proud to announce the launch of the Manx series at VISION. Based on the XLIN-FC, an inhouse developed Iinear detector, the Manx is a high-performance short-wave infrared (SWIR) camera providing high speed and quality line scan imaging. At unprecedented line rates of about 400 kHz, the Manx outclasses the state-of-the-art by a factor of 2.5, becoming the fastest linear SWIR camera available in the world. Achieving new grounds in SWIR imaging speeds potentially paves the way for ever faster inspection processes, increasing daily production capabilities for such applications. Silicon wafer inspections, TFT screen inspections, food and agricultural produce sorting are some industrial applications that would benefit from this new line of ultra fast linear SWIR cameras. The Manx is offered in 3 different resolutions of 512, 1024 or 2048 pixels. A 2048 pixel version will be available during VISION, demonstrating its high speed, high resolution imaging capability. The complete portfolio of infrared cameras will be presented on the booth. There is a strong emphasis on machine vision applications this year. Visit the booth for live product demonstrations on how linescan SWIR cameras are deployed in industries ranging from F&B (food and beverage) to semiconductor. Still, those working in other industries should not be discouraged. Research projects can look forward to discovering the SWIR cameras offered by Xenics. 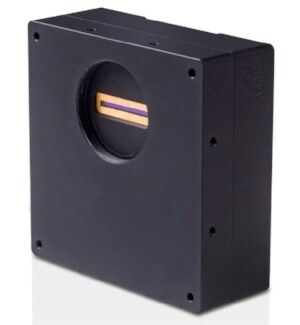 Many of these cameras hold unique attributes, such as the fastest area-scan SWIR camera, the Cheetah series, or the Xeva camera series with its extended response up to 2.5 μm. For system integration and product development projects, a wide range of solutions are offered, from ready to use full cameras down to camera modules and detectors. To help you select the most suitable product for your project, the technical team will be present on the booth to provide their assistance and expertise. As an added bonus, sneak previews of a next generation camera will be available to booth visitors. The Wildcat 640 is an upcoming SWIR area-scan camera, bringing a combination of high quality and high-speed imaging for demanding industrial applications. The new camera achieves excellent image quality thanks to low noise and dark current. Able to image at speeds up to more than 200 Hz, the Wildcat is well suited for applications such as quality control, laser spot detection, and low light imaging where image quality is crucial. The Wildcat is set for release in 2019.